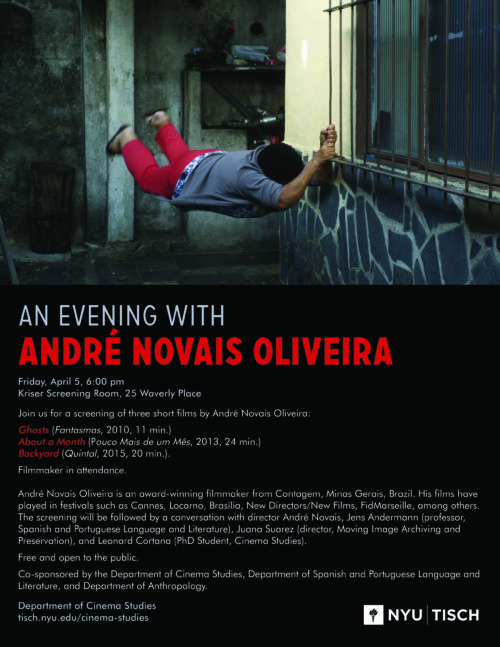 On Friday, the cycle on Latin American cinema at NYU will wrap with a screening of three short films by André Novais Oliveira, one of the greatest Brazilian filmmakers to start working in the past decade. His first short film, Fantasmas (Ghosts, 2009) is one of my very favorite films, and I’m happy more people will get the chance to see it in a theater. After the screening, there will be a conversation with the filmmaker, Juana Suarez (director, Moving Image Archiving and Preservation), Jens Andermann (professor, Spanish and Portuguese Language and Literature), and Leonard Cortana (PhD Student, Cinema Studies). The event is free and open to all.